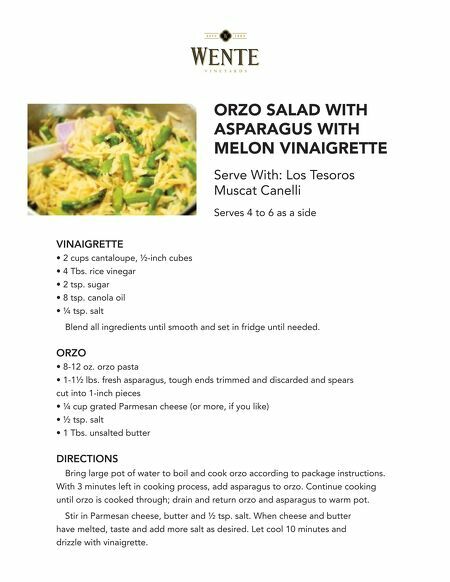 ORZO SALAD WITH ASPARAGUS WITH MELON VINAIGRETTE Serve With: 2013 Muscat Canelli Serves 4 to 6 as a side VINAIGRETTE • 2 cups cantaloupe, ½-inch cubed • 4 Tbs. rice vinegar • 2 tsps. sugar • 8 tsps. canola oil • ¼ tsp. salt • Blend all ingredients until smooth and set in fridge until needed. ORZO • 8-12 oz. orzo pasta • 1-1 1/2 lbs. fresh asparagus, tough ends trimmed and discarded and spears cut into 1-inch pieces • ¼ cup grated Parmesan cheese (or more, if you like) • 1 Tbs. unsalted butter • Bring large pot of water to boil and cook orzo according to package instructions. With 3 minutes left in cooking process, add asparagus to orzo. Continue cooking until orzo is cooked through; drain and return orzo and asparagus to warm pot. • Stir in Parmesan cheese, butter and ½ tsp. salt. When cheese and butter have melted, taste and add more salt as desired. Let cool 10 minutes and drizzle with vinaigrette.